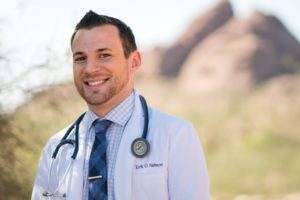 Immediately following the completion of his undergraduate degree from the University of New England, Dr. Erik O. Nelson followed his calling in medicine and headed West to Southwest College of Naturopathic Medicine and Health Sciences. “Once I toured SCNM I knew it was the right path for me. The campus is amazing and the staff and faculty go out of their way to make your naturopathic medical education individualized and make you feel like more than just a student, you feel a part of a community.” Furthermore, Dr. Nelson was drawn to the cutting edge scope including regenerative injection therapies and the Pain Relief Center (now known as the Neil Riordan Center for Regenerative Medicine). Dr. Nelson credits SCNM for preparing him for his career not only in medicine, but also in business. Business courses are a part of the SCNM curriculum. Students learn what to look for in a potential employer and how to start up their own practice with lessons in marketing to help it succeed. It was never a question as to where Dr. Nelson saw himself after graduation. His heart would always belong in his home state of New Hampshire. With a little help from SCNM’s job link website, he was able to connect with a clinic just minutes from his hometown. After establishing himself at Seacoast Spine and Sports Injuries Clinic, Dr. Nelson joined the New Hampshire Association of Naturopathic Doctors (NHAND). Through NHAND, Dr. Nelson heard about an opportunity with the New Hampshire Board of Naturopathic Examiners for an ND with experience in injection and parental therapies. With his experience from the SCNM Medical Center and Integrative Pain Relief Center, Dr. Nelson was appointed in 2018. When not seeing patients, Dr. Nelson enjoys coaching varsity boy’s soccer and is a member of an integrative team doctors at Kingswood Regional High School.